Normally, I like to make my plans to arrive at least one full day in advance, not just one night, and my sleep schedule here probably suffered greatly for foregoing this liberty. Even though I was pretty tired after I arrived at about 10 PM, I was only able to sleep for about 5 hours that night. To catch up on my sleep debt before the first round in the afternoon, I took a 3-hour nap a little later in the day. The next day, I again slept only 5 hours at night and took a 4-hour nap during the day. That set the tone for me for the entire event, as after that 2nd night, I didn’t get more than 3 hours of sleep after my games at any point. Instead, I would be awake very early in the morning and then sleep a lot during the day. Not ideal, but I managed to make it work out. Now I have a few days before my next event in Navalmoral, so I’m forcing myself to stay awake during the day to get myself to sleep during normal hours. Anyways, on to the chess. The tournament was a bit stronger than I expected based on the pre-registration lists online and it was definitely much stronger than last year’s edition (I didn’t play last year, but I know some people who did). There were about 150 players with 28 GMs, 26 IMs, and over 60 players rated above 2300 FIDE. Black’s position doesn’t look so bad – he’s got all his pieces out and he has more central pawns (and fewer pawn islands). Meanwhile, white has a slightly funny-looking pawn on e3. Unfortunately, for Black, though – his d6-pawn is a real liability and White’s two bishops, while currently not so powerful, will really come into their own once those center pawns are out of the way. After 18.Ne4, he played the natural 18…Bh6 (Rybka’s first choice on my machine, for example, on depth 11), but after 19.Rad1 Bxe3+ 20.Kh1, Black was in real trouble. He can guard the d-pawn with 20…Qc7, against which I was planning 21.Qc3 Bh6 22.Qa3! (hitting a7 and d6, thereby winning the pawn back favorably). Instead of 20…Qc7, he played 20…d5, but after 21.exd5 exd5 (21…Rxd5 22.Nd6+ is good for white) 22.Nf6 Qc7 (White was threatening Qf5+) 23.Ng4, he couldn’t save his bishop and deal with the threat of Qf5+, winning the knight on e5. My setup with …f5 and …c5 was predicated on playing …cxd4 and …Nc5 later, after which I’d be ready to expand in the center with …e5 and/or take the bishop pair with …Nxd3+. He wanted to stop that and thought the weak f5- and h7-pawns would justify his central pawn push. Instead of this, though, he should have played 15.Ng5 with a small advantage. After 15.d5, I responded with 15…exd5 16.Bxf5 Rxf5! 17.Qxf5 Ne5 18.Qc2 Nxc4. Black has a bishop and pawn for the rook, but he doesn’t appear to be so well developed and his kingside is devoid of defenders. Based on this, I didn’t think I would have enough compensation at first, but on closer inspection, I decided Black was already a little better! I don’t think it’s winning, but I do think Black has some advantage because of the potential in his position. 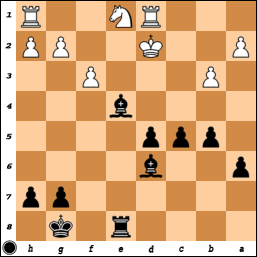 If Black can regroup with say …h6, …Qf7, and …Bf5, it’d be hard to dispute his advantage. White has no attacking chances on the kingside, while Black dominates the center and queenside with his pawns and minor pieces. Thus, it’s up to White to make something of Black’s relatively undeveloped state, but how? If 19.Ng5, then 19…g6 prepares 20…Bf5. 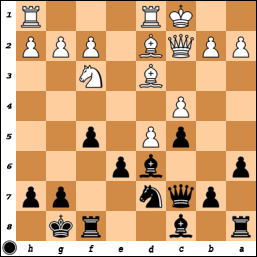 If 19.Be3, Black has 19…Nb6, guarding the d5-pawn and preparing …d4 amongst other things. Finally, if 19.Rhe1, Black has 19…Bg4, when the bishop can be rerouted to a nice square on g6 via h5, or come back to f5 after something like …Rf8. He chose 19.Qd3, hoping for 19…Nb6 20.Ba5!, but after 19…Qf7 20.Ng5 Qf5, he found nothing better than to enter the endgame, but that was very much in my favor. In order to remove my powerful bishop from e4, he played Ne1 and now f3, but his dark-squares and 2nd rank were too weak. 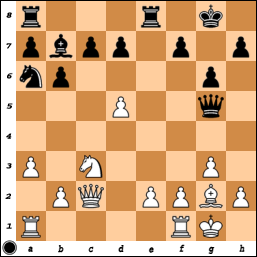 After 28…Bf4+ 29.Kc3 b4+ 30.Kb2 Bg6, he has no good way of dealing with …Re2 and …Be5 mating. He tried 31.Nd3 Re2+ 32.Ka1, but 32…Bg5 finished him off. A nice finish is 33.f4 Bf6+ 34.Ne5 Rxe5! 35.fxe5 Bxe5 36.Rd4 Bxd4 checkmate! At this point, I figured I was winning – with Rd6, I would win the g6-pawn next with check and invade, and to add to his troubles, he was essentially playing on the 30-second increment at this point while I had 37 minutes left! 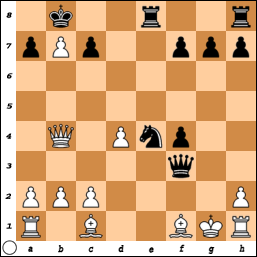 However, he found the best move in this position with 29…Qe7!. I was expecting him to play 29…Qf5, when I had planned: 30.Rxg6+ Kh7 31.Rxh6+! Kg7 (if 31…Kxh6 32.Qd6+ wins the rook on c7 with check and then the bishop on b7, as 32…Kh5 loses to 33.g4+) 32.Rg6+ Kh7 33.g4!!. The g4-move isn’t the only way to do the trick, but it is particularly effective since now Black has to deal with Qh3 mating ideas. He can check my king forward with 33…Qb1+ 34.Kf2 Qc2 35.Kg3 Qg2+ 36.Kh4 Qxh2+ 37.Kg5, but the king is quite safe on g5 and he is powerless to stop White’s queen from entering his position on d6 or f8 with decisive impact. After 29…Qe7, the game continued 30.Rxg6+ Kh7 31.Qh3? (31.Qc3 was winning, when White has 32.Qc2 and 32.f5 as his big threats) Qc5+! (it’s important to check the king to h1 as it sets up back-rank mating ideas) 32.Kh1 Qf8 33.Qe6?. From 29.Rd6 to this point, I had spent 8 minutes, and I thought this position was winning. Sadly, it’s Black who has the winning chances in this position! With 33…Bc8! 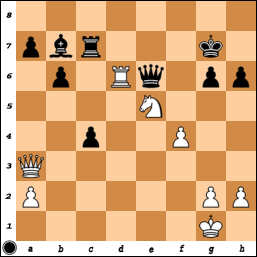 34.Qd5 (White’s best is 34.Qd6 Qxd6 35.Rxd6 c3 36.Rd1 with chances to hold the endgame) Rc5! 35.Qe4 Rxe5! !, Black wins. 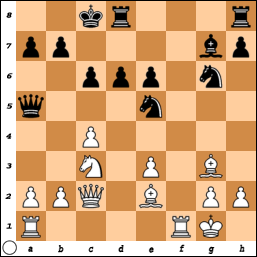 On 36.Qxe5, the rook on g6 falls, while on 36.fxe5, we see why the check on c5 was so important as 36…Qf1 is mate. Luckily for me, Gerzhoy overlooked his only chance to get into the game here. Instead of 33…Bc8, he played 33…c3 34.Rf6 (White is now threatening 35.Qf5+ if the Black queen moves) Bc8, spotting the idea one move too late. 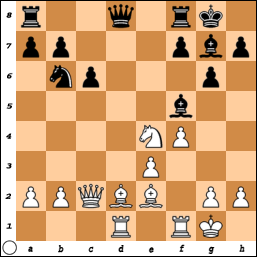 Here, though, it doesn’t work as White has the very nice 35.Nd7! !, jamming up the works. 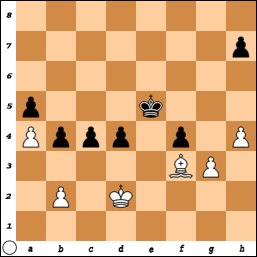 On 35…Rxd7, White wins with 36.Qf5+ (he can’t take the queen right away because of …Rd1+) Kg7 37.Qg6+ Kh8 38.Rxf8 mate. 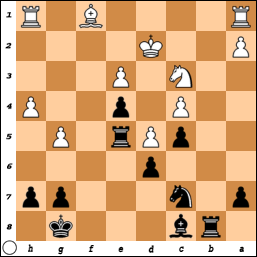 If 35…Qg7, 36.Qf5+ Kg8 37.Rf8+ wins the Black queen with mate soon to follow. He played 35…Bxd7, but resigned after 36.Rf7+! 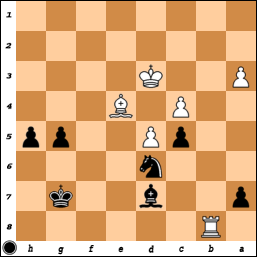 Qxf7 37.Qxf7+ Kh8 38.Qf8+, as 38…Kh7 39.Qe7+ wins the rook on c7 by force. If Black moves to g6, White checks from d6, while if he goes to g8 or h8, White checks on d8. With this win, I moved up to 3/3 along with a handful of other players. They’re already two rounds into chess’ version of March Madness – in November and December … in Siberia (Khanty Mansiysk, Russia) – but I figured I’d post my predictions for the remainder of the brackets. The only American player left is GM Gata Kamsky, and while I expect him to get past GM Wesley So without too much trouble, he might well face a recent nemesis of his (GM Pavel Eljanov) after that. Kamsky won this thing the last time around. After that, I say Grischuk, Karjakin, Gashimov, and Svidler all advance (with wins over Vachier Lagrave, Mamedyarov, Bacrot, and Kamsky, respectively). Then, in the final four: Grischuk over Karjakin and Gashimov over Svidler, with Gashimov winning it all in the finals. Amusingly, if Gashimov wins the World Cup, he’ll qualify for the Candidates final which he probably will already be in based on his FIDE Grand Prix results and the fact his home country (Azerbaijan) gets to nominate somebody. Last week the SF Mechanics squared off against the Miami Sharks in the Division finals, with the winner going on to meet the winner of the New York – New Jersey match (New York ended up advancing). While the final score was 2.5-1.5 in favor of the Sharks, we weren’t really in serious danger of being in the match. With draw odds and white on boards 1 and 3, we went into the match with high hopes, but as it was, history repeated itself and for the 3rd time, we lost in the playoffs with draw odds to Miami. I say we kick them out of the Western Division! On board 1, Jesse was worse against Becerra’s surprise Grunfeld. Black equalized pretty quickly in the opening, but it wasn’t too bad for White. Unfortunately, Jesse found it difficult to back up the weakening f2-f4 thrust and soon shed the e3-pawn for no compensation. He was only saved when Becerra took a draw in a winning Rook and Pawn endgame to clinch the match for Miami. On my board, I was doing alright. Lugo surprised me with the Two Knights, but after some slightly non-standard maneuvers, I had played …c6. With …d5 soon to follow, I thought I had equalized. White doesn’t really have any kingside initiative, and after the pawn exchanges on d5, White has fewer pawn islands, but he can’t get at the d5-pawn so easily and his queenside pawns are a little weak. On board 3, David was pretty much lost against Moreno Roman. David likes to play the King’s Gambit (even though Fischer refuted it ages ago! ), and every so often, he produces a brilliancy like he did in France a month ago against GM Bogdan Lalic (take a look at the game here). Unfortunately, this time, he was on the receiving end of a miniature, as he allowed …Qh4+ in the opening and then had to defend against a furious onslaught. I’m not sure if the position was defensible to begin with, but from the above diagram, it ended in another move after 16.Qe1 Ng3. On board 4, Yian was keeping it together against Rodriguez. With a big time advantage and a position that was about equal, I figured we’d have to rely on our two relatively equal positions to turn into wins. Sadly, after 16.Rxh8 Bxh8 17.Nd3, Yian allowed White to favorably change the structure by playing 17…Bg6. Now 18.Nxe5 dxe5 19.g4 (19.e4 looks even better) Qh7? 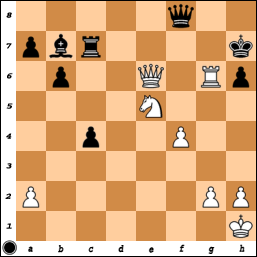 20.gxf5 Bxf5 21.e4 netted White a pawn, and Rodriguez cleaned up in a nice fashion. Instead of 17…Bg6, 17…Nc6 looks quite reasonable for Black. I played 20…h5! here, and Blas took a wrong turn with 21.Nh2. After 21…Bf6, Black is hitting the b2-pawn, but more importantly, he is threatening to play 22…Be5, trapping the knight on h2. White would have no choice but to give up his g-pawn then with 23.g3, but that’s a rather important pawn. Thus, Blas played 22.Qf2, but after 22…Be5 23.Nf3 Bg3, he lost the exchange. Instead of 21.Nh2, he could have played 21.Nf2, which is a little better. 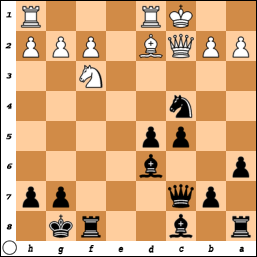 Still, I think Black’s position is better after 21…Bf6 22.c3 d4!. I ended up winning this game, but the finish of this game took place after the match was already put away by Miami. So, as has been the case most years except for 2006 (when we won it all), we wait for next year. I think the team could have done better this season, but we did alright given the fact we were piecing together a lineup for pretty much every match. From a personal standpoint, I was satisfied with my play. I lost my first two games of the year (the game against Stripunsky was a bad one, but the game against Barcenilla was pretty good and I should have won that one), but then scored 3.5/4 the rest of the way. Thanks to the 2 losses in 6 games, this was the first time in 5 years that my performance rating in the league was below 2550 FIDE. I clocked in at 2495 FIDE, marginally above my 2492 FIDE rating average for the season. Team captain John Donaldson has recapped the team’s performances in more detail at the team blog. The finals match is scheduled for December 7th, and features Miami and New York. My guess is that New York will carry the day. With a double-GM lineup and then the underrated (for the league) Yaacov Norowitz on board 4, they seem to have the more dangerous lineup. Still, Miami has scored some big upsets themselves to get to the finals, so it won’t be an easy match. Last night the SF Mechanics faced off against the Arizona Scorpions in the Western Division quarterfinals. As the 2nd place finishers during the regular season, we had draw odds (meaning we advance on a 2-2 tie) while they had choice of color on boards 1 and 3. We had a topsy-turvy match against them earlier in the regular season (which they won, 2.5-1.5), but this time, we controlled the tempo from the start. I was white on board 2 against IM-elect Daniel Rensch. We’ve played 3 times over the past 5 years, but I had black in all those games (with 2 draws and 1 loss). I think this was his first appearance on board 2 in the USCL, but the Scorpions probably wanted to get a master on board 4 to deal with Yian Liou, our underrated anchor. 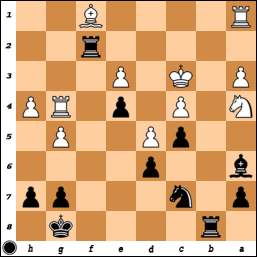 Instead of the normal 8…c6, which commits White to a real pawn sacrifice, Black played 8…Ne4. After 9.cxd5 Bxh4 10.Bxe4 Bf6, Black is stuck with a worse pawn structure and a bad bishop on b7. This is similar to a line after 7.Re1 (instead of the 7.d5 that I played) that goes 7…c5 8.d5 exd5 9.Nh4 Ne4 10.cxd5 Bxh4 11.Bxe4 Bf6 – in this structure, though, Black’s c-pawn is on c5 already, so what he has is a slightly odd Benoni structure with his bishop on b7. It’s maybe not the best line against 7.Re1, but it is certainly quite playable. White has two main threats: one is 17.Ne4, exploiting the weakened kingside dark squares, while the other is b2-b4 at some point, sidelining the knight on a6. I think White has a big positional plus, for example, 17…Qe5 (not 17…Qe7 18.d6!, winning a lot of material) 18.Rad1, and Black is going to struggle to activate his minor pieces or deal with White’s central pawn roller with e4 and f4. However, Danny may have missed the strength of Ne4 as he played 16…c5, trying to fix his queenside pieces and structure. After 17.Ne4 Qe5 18.f4 Qd4+ 19.e3! Qxe3+ 20.Kh1, Black has no good way of dealing with the knight hops to d6 and f6, and so he’s forced to give up the exchange with 20…Rxe4. With relatively equal positions on the other boards at this point, this put a lot of pressure on the other Arizona players to try and make something of nothing, as they had to score 2.5 to advance. Danya’s game on board 3 was the only one I thought had decent chances of being decisive, and in the end, that was the first game to finish – Danya outplayed Adamson in a complicated position in mutual time pressure. Meanwhile, I was doing my best to screw things up. Instead of playing for checkmate with 33.Qxh7, I played 33.Rxd5 Bxd5 34.Qxd5. I was now up a piece for a couple pawns, which was completely winning, but like a complete idiot, I botched the endgame in epic fashion. In the above position, I played 46.g4? ?, after which it’s Black who is winning! After 46…d3 47.b3, instead of 47…cxb3? ?, Black can win with 47…Kd4!. I only realized this after I played 47.b3. After 47…Kd4 48.bxc4 b3, Black has 3 passed pawns, and White’s king and bishop can’t hold them all off. Instead of 46.g4? 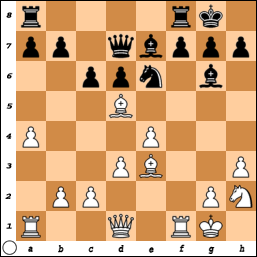 ?, though, White is winning with 46.gxf4+ Kxf4 47.Bd5. The pawns are picked up after 47…c3+ 48.bxc3 dxc3+ 49.Kd3 Kg3 50.Bb3 Kxh4 51.Kc4. White picks up all the queenside pawns and gives his bishop up for Black’s h-pawn. That was my original plan, but then I saw the b3 idea, and I figured that was even simpler. Oops. Luckily for me, Rensch didn’t spot the …Kd4 idea, although it probably wouldn’t have made a difference for the overall result. Ramirez and Wolff were exchanging draw offers on board 1 – Wolff was playing on a computer without the sound on, and so he didn’t hear the draw offers, and ICC doesn’t show the move number for the draw offer (not sure why they don’t implement this simple change), and so he kept noticing the draw offers too late. Meanwhile, Yian ended up winning the drawn endgame on board 4, so we ended up with a big 3.5-0.5 victory. Thus, next week we face off against the Sharks. While we’ve generally done well against them in the regular season, we are 0-2 against them in the playoffs (they eliminated us in 2005 and 2007 by a 2.5-1.5 score in each match). Hopefully the third time is the charm! Yesterday was the last round of the 2009 USCL regular season. Going into the match, we were tied with the Arizona Scorpions for 2nd place in the Western Division, a full match point behind Seattle and a point ahead of Miami. (1) A win in our match, coupled with an Arizona loss and a Seattle loss would give us the 1st seed in the West, because while we’d be tied on game points, our opponent’s average rating was higher than Seattle’s. (2) A win or draw in our match, coupled with an Arizona loss and a Seattle draw or win, would give us the 2nd seed. (3) A draw in our match would give us 2nd place at best, and only if Arizona lost their match (again, our opponent’s average rating was higher than Arizona). If Arizona drew their match, then they’d have more game points than us, and so it wouldn’t get to the opponent’s average rating. Dallas has traditionally been a pretty tough match for us, so we weren’t expecting a cakewalk. An hour or so into the match, it wasn’t really clear to me how we were doing. My game wasn’t particularly interesting – Bercys surprised me with the Queen’s Gambit Declined. I had been expecting a King’s Indian, so this was a big departure from the norm. As it was, we repeated a game of mine against a British GM earlier this year for a little less than 20 moves. That game ended in a draw, and this one was headed for the same result. I played a bit too loosely on the kingside, but with a big time advantage, I wasn’t in too much trouble. By the time it was clear that I wouldn’t have any winning chances on my board, our board 4 phenom, Yian Liou, beat WFM Zorigt on board 4 in a strange Dragon endgame. At that point, we were a little better on board 3 (Naroditsky was up the exchange, although I thought White had decent compensation) and clearly better on board 1 (where Wolff had turned around a dubious-looking opening into a big endgame advantage). I quickly offered a draw, and Bercys was kind enough to accept. White has to cover the b2-square, and so Ludwig played 24.Kc2. Wolff played 24…Ba6, threatening …Rb4 in some lines, so Ludwig covered that with 25.a3. Patrick then rerouted his knight nicely with 25…Na8!, heading for b6. This further inconvenienced White, who had to play 26.Na4 to cover the b6-square. 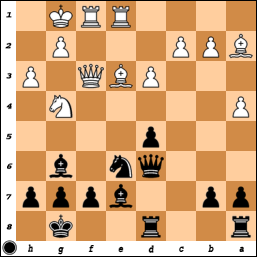 With the e4-pawn no longer attacked, Black had a free hand to come in via the f-file with 26…Rf5!. With a series of jabs, White has been backed into a corner. 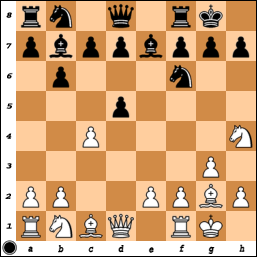 Instead of 29…Bc8 (which maintains a clear plus, because 30.Rxe4 loses to 30…Bf5 31.Re7? Rc2#! ), Black had 29…Nxd5+!, taking advantage of the fact the Bf1 has one less defender. 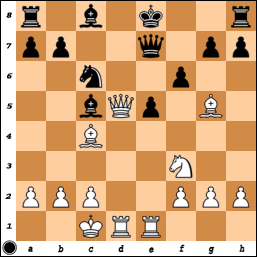 After 30.cxd5 Bxf1 31.Rxe4 Bg2, White is toast – Black’s rooks and bishop are too active, and White’s king is too exposed. On the plus side, at this point, Arizona had already gone down to Miami, so we were playing with house money in a sense as the 2nd seed was ours. However, the Seattle match was up for grabs, and if they lost, we would have liked to get at least 2.5 from our match to take the top seed! Unfortunately for us, after some good defense from Ludwig and mistakes in mild time-pressure, Wolff found himself having to defend an exchange-down endgame. This was the final chance in my view for Black to try and save the game. Patrick played 48…Bh3, going after the c4-pawn. 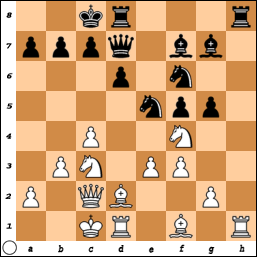 While it does win a pawn, it frees the d5-pawn for White and that is the more important factor. Black’s connected passers never became a factor and Ludwig pushed his d-pawn all the way. It seems to me that Black can try for a draw with either 48…Bc8 (forcing the rook to take the a7-pawn with Ra8xa7, while Black pushes on the kingside) or 48…Kf6 (centralizing the king, and again planning to push the kingside pawns). In any case, the result of this game was a moot point as Seattle held on for a draw. Thus, we took 2nd place in the Western Division, behind Seattle and ahead of Arizona and Miami. After winning the division in 2005 and 2006, we’ve taken 2nd place the past 3 years. Our best regular season record of 8.5/10 however has gone untouched, as both Seattle and New Jersey fell just short of the mark this year. Next week, we’ll face the Scorpions with draw odds (they’ll choose the color they want on board 1 tonight). We have a 1-1 record against them historically. With a bit of a lull in my chess schedule (I haven’t played a tournament since the SPICE Cup ended on September 27), I had decided to take the GRE to get it out of the way. I’m not applying to graduate school this fall, but as I’m likely to at some point, it’d be nice to take it when I’m not particularly busy with a tournament or job. It’s been a while since I’ve taken a test of any kind and even longer since I’ve taken a standardized test. This was also the first time I took a computer-adaptive test. While the GRE is supposed to be an exam that pretty much all prospective graduate students take, I was surprised by the subject content. On the one hand, the verbal section was quite difficult. I was happy with my score, but it could easily have gone the other way had I not been exposed to some of the more difficult words. Is a vocabulary test the best measure of how well a prospective graduate student is going to do? I highly doubt it. 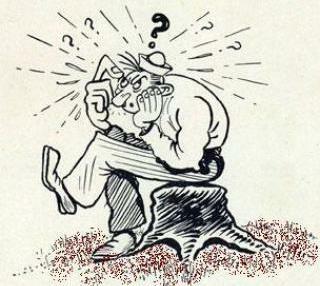 One of the more difficult words I had to identify (and did) on a practice test was nostrum. While some words were part of a practice vocabulary list culled from a prep book, nostrum wasn’t such a word. Luckily, though, I have seen pretty much every Seinfeld episode and had done a little research. He pretends to be a similar doctor when he “diagnoses” George Costanza’s boss with a potentially dangerous mole. A little trivia behind the episode reveals that nostrum means “a usually questionable remedy or scheme.” Luckily that pointed to panacea as the antonym and I was in business. But, as the test is adaptive, answering such a question incorrectly could lead to a much lower score, and so once you miss a question, it lowers your score and gives you a simpler question. Especially near the start of the test when the program’s “prediction” of your score is moving around much more, this takes on increased importance. Meanwhile, the math section is quite sad in my view. Despite being a test for college graduates, the math on the section is not really any more difficult than on the SAT and is at a basic high-school level. It tests basic arithmetic, algebra, and geometry – if you’re doing well, you might get a simple statistics or probability question. Why even bother making a math test like this? Getting a perfect score means you’re only in about the 95th percentile. These schools can already get our SAT score without too much trouble – why make people jump through the same hoop so many times? The only section that seems to test something really relevant is the analytical writing section. You have to write two essays, one presenting an argument in favor of or against a claim and then one analyzing an argument presented to you. This actually does test your ability to think logically while also allowing you to demonstrate a command of the language. For pretty much any graduate student, this seems like an important skill. The math and verbal sections, though, are pretty much useless in my view. Instead, a specific subject test of your desired field seems to be more appropriate. Another strange part of the exam experience is the strict rules at the testing center. No food or drink is permitted in the testing hall (which I guess makes some sense, since they don’t want people spilling stuff on the computers), but they even have policies on the number of tissues you can take in! Another test-taker had a runny nose and took 3 tissues from the Kleenex box. The proctor immediately told him that there was a limit of 2 tissues in the room at any given time, and that if he wanted to blow his nose, he would have to exit the room (which involves showing ID and signing in and out)! By the way, I gave an example of a word from a practice test because as part of a confidentiality agreement that every test-taker is bound by, I can’t talk about any question that I actually received on the test. This might partly be a result an ETS mistake, whereby their question pool is relatively small, and so questions can get repeated if you sit for the exam more than once. This was more of an issue in the mid-1990s, but I would hope it’s been resolved by now. I don’t plan on taking the GRE again, but if the question pool is still pretty small, then that could introduce a lot of bias into the scores.